The summer holidays are here and the kids are home. Now, if you don't want to be hearing that old holiday refrain – 'I'm bored' – then it's time to start planning some summer-filling activities. Luckily for you, we've done the leg work for you. Here's our definitive guide to the best of London's family-friendly, summer activities. Take all the family to this one – Luna Cinema, the UK's first open air cinema, are hosting screenings throughout the summer holiday for kids of all ages. Take them to see Moana or Paddington or Coco in the open air where they can run about if they do, for any reason, get a little bored. Perfect. Published in 1968, Judith Kerr’s tale has been entertaining children worldwide for decades. A story of the hungry tiger that unexpectedly joins a little girl and her mummy for tea has returned to the West End to celebrate its 10th anniversary and 50 years as Britain’s best loved picture book. For one afternoon only on 30 September, family party specialists, Big Fish Little Fish, will be transforming Fabric – one of London's most prestigious nightclubs – into a kids paradise. A chance for parents to relive their glory years on the dance-floor, only this time with a toddler on their shoulders. The event is aimed at eights and under, but children of all ages are welcome. Revisit the magic of the 1999 show, with this spectacular stage adaptation. 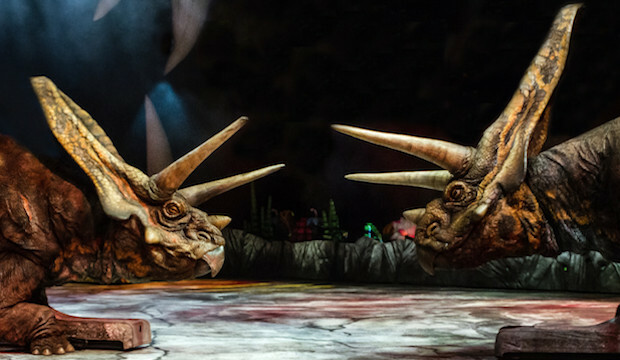 Coming to the O2 on the 14-19 August, Walking with Dinosaurs promises to be as awe-inspiring as it is educational. For those who miss it this time around, the show will be returning to London in December, this time at Wembley Stadium. Perfect for enthusiastic little ones. This free, outdoor sculpture garden in Regent's Park is the perfect place for a magical wander with the little ones. Children will delight in spotting the sculptures dotted around the park at every turn. Whenever you find yourself at a total loss of what to do with messy, naughty toddlers on your hands, take a trip to the Discover Children's Story Centre where a few hours of rushing about in with sights and colours will keep the kids occupied, and you happy. This summer, visit the 3-D technicolour world of beloved children's author Julia Donaldson and illustrator Axel Scheffler, with the UK’s first immersive exhibition of their wonderful work at the every friendly Discover Children's Story Centre. In celebration of Disney’s two landmark West End musicals, there's a glittering new pop-up shop in London's Covent Garden that is running special events and workshops running until the 26 August. Take your little princes and princesses to marvel at the masks, puppets and costumes from the Tony-Award winning The Lion King, and on a trip inside the specially-created ‘Cave of Wonders’, where they will be able to take a photo with the legendary lamp from Aladdin. There's MAC stage make-up masterclasses, puppetry demonstrations and vocal workshops galore. This is a must for your little Disney lovers. Step back in time this summer with Dinosaurs in the Wild at the Greenwich Peninsula. Part live action theatre, part theme park, this immersive experience is the ultimate activity for your dino-loving kids. And don't worry, we won't tell anyone if you enjoy it too. This interactive family show on the National Theatre's Dorfman Stage allows your mini-astronauts the chance to explore the galaxy. The show is improvised, meaning that your kids can be a real part of the action, giving them the opportunity to exercise their imaginations and think creatively. The National Theatre's Space Station exhibition will also be open for an hour before every performance of the show. Catch a family flick al fresco at Dulwich Park or Hampton Court Palace this Summer. From 21 July through to 4 September, London outdoor movie mainstays, Luna Cinema will be screening a whole host of kid-friendly classics including Toy Story, Star Wars, and Harry Potter and the Philosopher's Stone, as well as more recent smash hits, Moana and Trolls, across the two venues. Sweep your little ones off to an Arabian wonderland with this production of a timeless classic. A mad rush of colourful costumes, pantomime energy, and tireless dancing, this is sure to delight children of all ages. The nation's favourite superhero family are finally back for a long overdue sequel on the big screen. We're excited, your kids are excited, and you should be excited too. The film came out on 13 July to rave reviews, so get your ticket now - costumes optional. A series of workshops are taking over The Jewish Museum this summer. In support of their retrospective, Asterix in Britain: Life and Work of René Goscinny, the writer behind the Asterix and Obelix cartoons, children can participate in drawing workshops, comic book creation workshops comedy shows, parties and 'baby jazz (free events for under fives) throughout July. From the 27 July to 30 August, RHS Lawrence Hall is playing host to an immersive exhibition that leads guests underneath the waves and exposes the secrets of life in the deep blue. Featuring cross-sections of marine animals and full body specimens of whales, penguins and a great white shark, this is the exhibition for little ones with a curiosity about life in the ocean. Returning to London this Summer is the world's longest, fastest urban zip wire: 100 feet high and 225-meters long, kids age 8 and over can travel at speeds of up to 50 miles per hour, as they soak up a bird's eye view of some of London's most famous landmarks, from Lambeth Palace to Big Ben and the Houses of Parliament. Children age 8 – 15 require parental supervision. This world premiere adaptation of Patrick Ness' 2011 novel is an imaginative reimagining of a dark, but charmingly fantastical story. Mature themes of loss and emotional pain make this a better fit for older kids, but it promises to be an extremely rewarding experience. Kids Week – actually a month – runs for the entirety of August. During this time, under-16s can go free to a host of London's best shows, including The Lion King, Matilda, School of Rock and many more, when accompanied by an adult paying full price. Book promptly to avoid missing out on this hot ticket! This revival of Rogers and Hammerstein's 1951 musical classic is family-friendly romp. Beautiful costumes, spectacular sets, and enchanting music make this a great choice for a theatre outing with the kids this summer. Step out of the sunshine, and into the darkness this summer to meet some of the planet's most wonderful nocturnal creatures. Experience life for the cave-dwellers, the deep-sea-divers, and the hunters of the night, before stepping back into the bright Summer sun. The Junior Keeper for a Day programme allows young animal lovers the opportunity to go beyond the ordinary zoo experience, and to see what life is like for those who work on the other side of the fence. In groups of five, children will get the chance to lend keepers a helping hand with all of their normal keeper duties, to get closer than ever to the animals, and to see what work goes in to the maintenance of the London Zoo experience. This opportunity is only open to children between the ages of 11 and 15. Every summer, Buckingham Palace opens its doors to the public and welcomes the Queen's subjects (and everyone else) into the bowels of the palace to explore its many treasures. From 22 July, families can visit the Queen's residence and her many treasures there-in.